Chicago just experienced one of the most violent weekends of the year, with 11 people fatally shot and 63 more wounded between 3 p.m. Friday afternoon and 6 a.m. Monday morning. 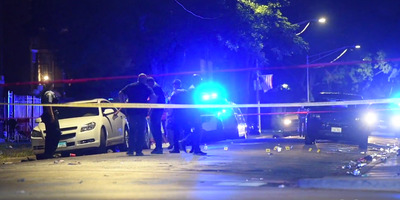 The high number of casualties underscored an ongoing discussion over how and if warmer weather increases violence. Some experts argue that there’s a positive correlation between warm weather and violence rates because warmer temperatures increases testosterone, sweating, blood circulation, and more. Others argue the positive correlation exists simply because more people are outside and in contact with one another, which leads to more violence. While other experts argue the positive correlation only exists in places where temperature varies dramatically, such as in Northern states versus Southern states. Some even seem to deny the warm weather argument altogether. 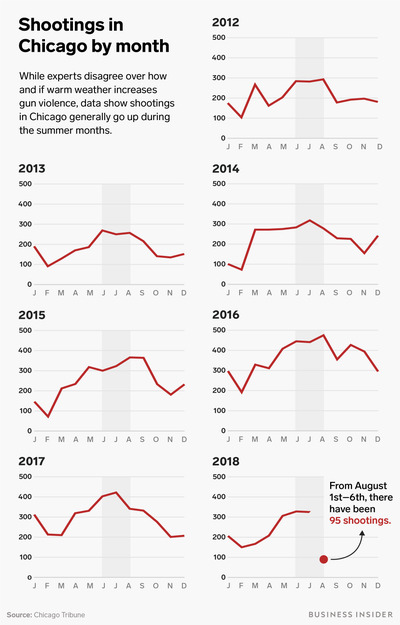 Whatever the case, the graphic below that we put together using data from the Chicago Tribune shows that gun violence generally rises in warmer months.